Are you ready for some softball? 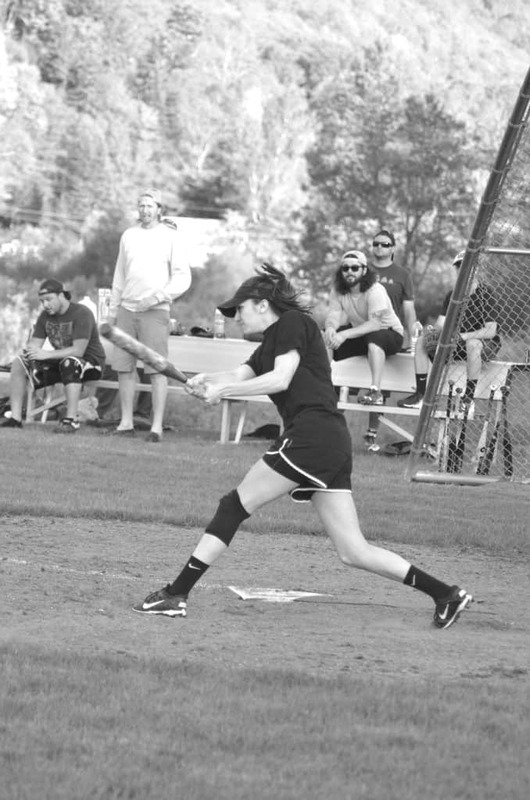 After a great winter it’s time for the Killington Softball League to get its game on, and it’s with snow still on the trails. There are two new teams in the league this year, and everyone kicked off the season Wednesday night, May 24, although not everyone scored a run. One of the newest teams, the OmyaRamas (O.R.) got blanked 33-0 by Killington Resort. The coach of the O.R., Bailey “Is It Too Late To Change My Mind” Peters used to play for the Resort team, so he’s been on the other side of a crushing mercy like that. This year, he decided to form his own team. It’s a work in progress. Speaking of work in progress, the Wobbly Barn is the other new team. They have some brand new players to the league — some that came out of retirement, like Dave Mac — and players that played for Outback Pizza last year. Ironically, Wobbly played Outback Pizza. They were more fortunate than the O.R. since they scored some runs, but the end result was the same, with a loss. This game had a lot of excitement as it began with a back and forth battle. The game was tight in the late innings, with the Outback clinging to a 9-7 lead, and then one big inning put the Wobbly away 14-7. The win was a solid team effort but a couple players stood out. Scott “Scooter” Watelet went three-for-three and scored every time. Scooter was traded in the off season by Clearly Moguls for this reason — taking his veteran skills to help a young team. Siobhan “We’re Co-Workers Brady” Chase pitched her first complete game and fielded well, too. If this league was scored on fun, the Wobbly Barn would be in first place. They had great team spirit with head cheerleader Ryan “Megaphone Dueler” Orabone leading the charge. The win for the Outback was huge because earlier in the night they suffered a huge defeat to the defending back-to-back-to-back champions, Clearly Moguls, 28-6. This game was close until the teams hit the field. C.M. did not miss a beat and that’s to be expected since they’re returning all 14 players from last year’s championship squad. Technically 15, but Will “I’m Really Retiring and This Year I Mean it “ Burdick is a substitute. C.M. started the game shutting Outback down 1-2-3 with the infield recording all the outs. Outback sent Coach Rob “Rambo” Ranberg to the mound for a rare start. C.M. lit him up for five runs behind RBI’s from Angel “No Home Runs” Shannon and Judd “Home Run King” Washburn. Hunter “I wanna Play for the Champs” Pike had a nice looking sac for the fifth run. Dylan “D Money” Johnson led off the second and it appeared as if he was going to blast the ball, but he hit it right back to “Ronzoni” Hacker who tossed it to Jeremy “Jackie Blue” Livesey for the out. Same exact thing with the next batter, but Siobhan “I Should’ve Been Pitching” Chase got the team’s first hit of the season as she burned Brando “Timber” Remick in left. Ranberg followed suit but they were both stranded on the bases. C.M. exploded on Ranberg in the second inning, scoring 12 runs as they batted through their order. Jared “Much More Fun” Hall, Ronzoni and “DJ” Dave Hoffenberg all reached base twice in the inning. Brett “Lookout Tree” Regimbald blasted a grand slam to really pour on the runs and Washburn hit his first home run of the season with a three-run-shot that landed on the library lawn. It was the farthest home run hit in this league in quite some time. Russell “The Love Muscle” Dalglish suffered the team’s first Cold Beer K (CBK) of the season. Outback finally got on the board in the third when both Chris “Too Bad I’m Not On Your Team” Kielbiowski and Owen “The Juice” Johnson scored. Both players were on loan for this game and Owen is the brother of Dylan, who is a regular member of this team. It was the younger brother shining in this family affair. Clearly Moguls answered with eight more runs to stretch their lead 25-2. Washburn added another three-run-shot, “Tall” Tom Gilligan got in the home run club with a long blast to center field and Hall showed his speed with an inside-the-park home run. “DJ” Dave joined Dalglish in the CBK category. Outback had a great fourth inning, scoring three runs with two coming from Chase and Ranberg off Kielbiowski’s two-run double. The other was scored by Alexis “Newbie” King who was driven in by her boyfriend Evan Johnson. That’s a lot of Johnson on that team. Speaking of Johnsons, Owen fizzled out when he struck out looking, for a big “CBK.” C.M. added three in the fourth and had a chance for more, but Regimbald was robbed of a home run by King because he only had warning track power. Dylan was able to drive in the team’s last run. but in the end the Outback suffered the mercy loss. The last game on the slate was between McGrath’s Sushi and Max Team. Runs were at a premium in this game as none were scored until the third as M.S. got on the board when Joe “Karaoke King” Montemurro scored. They added another in the fourth when Zach “Cookie” Cook scored. Great defense was played by both teams with not many players reaching base. The game could have gone either way until M.S. exploded for three runs in the sixth for a 5-0 lead. Cook and “Bus” Bob Schaffner both drove in runs. Max Team avoided the shutout by scoring one run, but in the end suffered the 5-1 loss. M.S. pitcher Bob “The Other Bob” Pauly was en fuego on the mound. He delivered four CBKs which included one each to Sam Budusky and Johnny “Not So” Sharpe. Wobbly Barn vs McGrath’s Sushi @ Killington 5:50 p.m.
Wobbly Barn vs Killington Resort @ Killington 7 p.m.
Outback Pizza vs Max Team @ Bridgewater 5:50 p.m.
OmyaRamas vs Clearly Moguls @ Bridgewater 7 p.m. There will be a post-game party at McGrath’s Irish Pub from 8-11 p.m.
OmyaRamas vs Outback Pizza @ Killington 5:50 p.m.
Max Team vs Wobbly Barn @ Killington 7 p.m.
Clearly Moguls vs Killington Resort @ Bridgewater 5:50 p.m.
McGrath’s Sushi vs Killington Resort @ Bridgewater 7 p.m.
Outback Pizza player Siobhan “I Should’ve Been Pitching” Chase got the team’s first hit of the season as she burned Clearly Moguls’ Brando “Timber” Remick during the May 24 game in Killington.